Comprising by far the largest and most diverse group of vertebrates, fishes occupy a broad swathe of habitats ranging from the deepest ocean abyss to the highest mountain lakes. Such incredible ecological diversity and the resultant variety in lifestyle, anatomy, physiology and behavior, make unraveling the evolutionary history of fishes a daunting task. 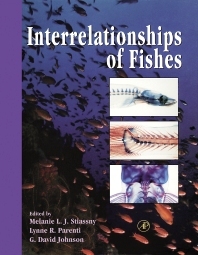 The successor of a classic volume by the same title, Interrelationships of Fishes, provides the latest in the "state of the art" of systematics and classification for many of the major groups of fishes. In providing a sound phylogenetic framework from leading authorities in the field, this book is an indispensable reference for a broad range of biologists, especially students of fish behavior, anatomy, physiology, molecular biology, genetics and ecology--in fact, anyone who wishes to interpret their work on fishes in an evolutionary context.